Creating loyalty one interaction at a time. The trend in business for the past several years has kept folks focused on building their brand, be it personal or for their company. Build loyalty, foster trust and do whatever it takes to keep people coming back. As a business owner and a customer, I am loyal to people rather than brands. You might have an incredible product. Unless you are the only company to offer it, I like most people, will shop around, not for a better price, but for the best and most consistent service. I do this on a regular basis because we are a U.S. Army family. Every three years, the military picks us up on one post and drops us off at another. After each move, the customer (and personal) relationship-building process starts over. I am also a Starbucks regular. I budget for my habit and visit Starbucks almost daily. We are fortunate to have three locations here on Fort Benning. Like every other city in America, I can also choose from multiple stores in the Columbus, GA metro area, just outside post. The Starbucks closest to my house is 5 minutes away, located on Fort Benning. The stores on post are licensed stores, not corporately owned. This means I can use my rewards card to purchase my drinks, but I cannot redeem my reward points. I must go out in town to do so. Instead of using my rewards, I bank them to use when I travel, so I can continue to patronize my favorite Starbucks on post. Why do I feel this kind of loyalty to a store? Why do I even go in the first place? I can drink coffee or tea at home for less money. The reason? 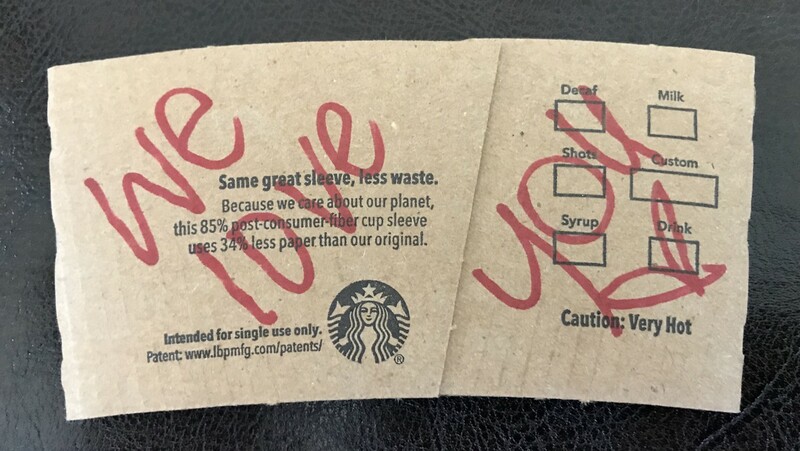 The people working at my Fort Benning Starbucks sent me the image above two days after I had surgery, when my husband picked up a drink for me while I was home recovering. The note pictured above was written by Ashley, who has become my friend since I moved to Fort Benning. Our friendship evolved as I became a regular customer at the Starbucks where she works. Over time, we’ve gotten to know each other well. We share what’s happening in our lives, our kids’ and the military in general. We commiserate when our spouses deploy. Her husband just left for a 15-month deployment to Afghanistan. My husband just returned home from his. We understand the strain deployments put on families, the PTSD, traumatic brain and other injuries. Bottom line, I know the people who work at my Starbucks care about ME, not my money. This fact alone keeps me loyal. Because we developed personal relationships, I stop not only to get my drink, but to socialize and support my friends. Regardless of your product, service or brand, what matters most are the relationships you create. In a world where people can shop just about anywhere for anything, you need more than brand loyalty to thrive in today’s business culture. People are much more than sales transactions. Financial wealth is fleeting. Strong relationships, once built, can last a lifetime. It simply requires a change of focus. When your metrics change from profit to people, you’ll soon find yourself a relationship rock star!